The acidy smell of commercial glue mixed with plastic hit me as I opened the office door. I had never noticed the flooring before but instinctively looked down and sensed something different. I asked and my senses were confirmed. The flooring had just been replaced. I wasn’t consciously aware of it, but at one time, I made a connection with new carpeting and the commercial glue smell wafting to my nose that day. But my brain knew the connection. Our senses pick up on thousands of smells, tastes, and touch sensations each day along with countless sounds and sights. In this bombardment, certain sensory elements stay with us in our memory. My awareness of new carpeting smell reminded me of just how important our senses can be to a healthy memory. Our sense of smell is getting a lot of attention lately as it’s closely associated with memory in general. A lesser sense of smell may be indicative of cognitive changes and memory loss, so much so that in the near future, a simple smell test could be an early indicator of dementia. A recent study also looked at smell and determined that two distinct types of brain cells respond differently to smells. One identifies the general type of smell and another, with practice, can specify that same smell into greater detail and variations over time. Wine in general versus the nuances of different berry or chocolate smells within a wine, for example. You may be experiencing additional sensory input this week if traveling or celebrating upcoming holidays. Whether it’s a new city, culture, environment, or celebratory food, pay attention to all the sights, sounds, smells, tastes and touches around you. Take them all in. Make connections and associations and file this sensory input away in your memory. These sensory memories can serve you well by enhancing your quality of life, but also help in the future when they prompt a memory. Take a moment and smell the roses-literally. 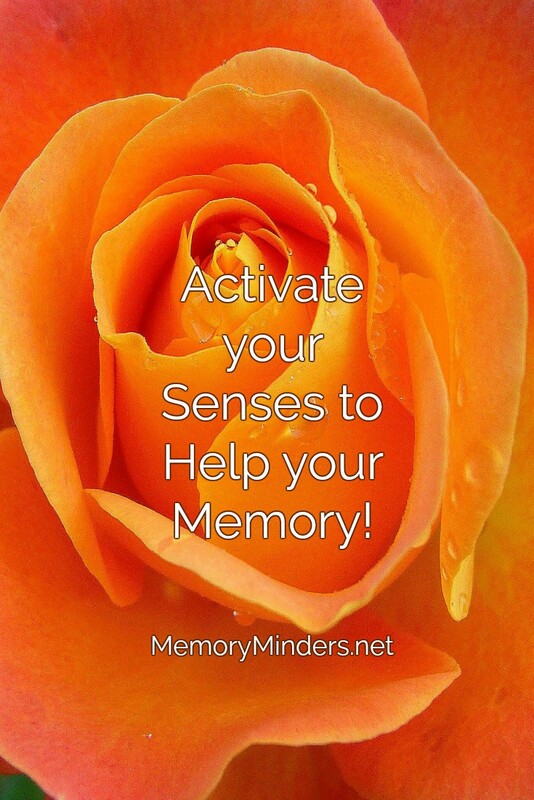 Pay attention to all your senses and improve your memory!